Elizabeth Margaret Chandler was a noted author and abolitionist poet in the early 19th century who became the first woman in America to make the abolition of slavery the principal theme in her writing. Her brief life was marked by a series of literary achievements that can only be described as impressive, given the virtual invisibility of women at that time. Elizabeth Margaret Chandler was born December 24, 1807 in Centre, Delaware to Thomas and Margaret Evans Chandler. She had two older brothers, William Guest and Thomas. The Chandlers were members of the Religious Society of Friends (Quakers), and they lived the strict, orderly and disciplined life of a Quaker family. After both parents died during her early childhood, Elizabeth was raised by strict Quaker relatives in Philadelphia and attended a Quaker school. There she embraced the strong anti-slavery stance of the Quakers, and began writing at an early age. Leaving school at age twelve or thirteen, she continued to read and write with a passion, publishing poems about nature at age sixteen. At the early age of sixteen, Elizabeth Chandler's romantic verses on nature were first published. In 1825, when she was eighteen years old, her emotional antislavery poem "The Slave-Ship" was published. The poem won a prize as well as the attention of abolitionist Benjamin Lundy, who encouraged her to write for his periodical, the Genius of Universal Emancipation. She contributed to and edited the "Ladies' Repository" section of that paper, in which her articles appealed to women to demand better treatment for Native Americans and the immediate emancipation of slaves. She became one of the most powerful women writers of her time. She often used the tragic example of women slaves being torn away from their children and their husbands. Thereafter, she wrote mainly about the institution of slavery and its human toll. In reply to those who argued that women lacked the power to abolish slavery, Chandler countered that, as mothers, women were in a unique position "to give the first bent to the minds of those, who at some future day are to be their country's counselors." While living in Philadelphia, Elizabeth Chandler belonged to the Philadelphia Female Anti-Slavery Society and actively supported the free produce movement - the boycott of goods produced by slave labor. It came about as a method to fight slavery by having consumers buy only produce derived from the labor of free men and women who were paid for their work. In this context, produce means anything produced by human agricultural labor. This was an attractive concept for the pacifist Quakers because it offered a non-violent method of combating slavery. The boycott began in earnest in 1826 when abolitionist Quakers in Wilmington, Delaware drew up a charter for a formal free produce organization; the same year in Baltimore, Maryland, Benjamin Lundy opened a store that sold only goods obtained by labor from free people. The boycott became an official movement in 1827 when Thomas McClintock and others formed the Free Produce Society of Pennsylvania in Philadelphia. The boycott, practiced by many Quakers as well as other abolitionists, included not only cane sugar and other edible agricultural crops, but also fabric made from cotton planted and harvested by slaves. James Mott, husband of Lucretia Mott, was a member of the Committee of Correspondence. The cotton fabrics sold in the free produce stores came from farmers who did not own slaves, mainly in North Carolina. The societies then had the cotton woven into bolts that could be sold by retail merchants. In 1829, members reported that their contractors had spun 2,515 lbs. of "free Upland Cotton," and manufactured some it into "ginghams, checks, bed-tickings, stripes, kitting and sewing cotton and cotton hose." The fabrics thus produced were usually more expensive and inferior in quality, but those supporting the cause continued to buy them. Many women used them for quilt making, lining bonnets, aprons, bed ticking, underwear and mending. Black abolitionist Frances Ellen Watkins Harper always mentioned the free produce movement in her speeches, saying she would pay a little more for a "Free Labor" dress, even if it were coarser. Free produce also enabled abolitionist women to engage in several business activities. Seeking to clothe their families in morally untainted fabric, Philadelphia women started one of the first free produce societies, the Female Association for Promoting the Manufacture and Use of Free Cotton. Some black businesses began to feature free produce; an African American confectioner used nothing but sugar from free will labor sources, and received the order for Angelina Grimke's wedding cake. Elizabeth Margaret Chandler wholeheartedly supported these ventures, but the bulk of her contributions to the abolitionist movement was with her pen. It is difficult to say exactly how influential her writings were to the public at large, but many of her articles were copied and circulated in the most popular newspapers of the time. 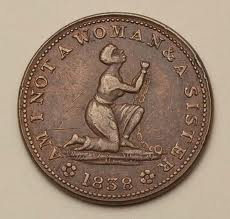 She also introduced one of the most famous abolitionist images, the kneeling female slave with the slogan Am I not a Woman and a Sister, which was adapted from the image of a male slave for the seal of the Society for the Abolition of the Slave Trade. William Lloyd Garrison adopted this symbol and slogan to head the ladies department of his paper, the Liberator, one of the most prominent abolitionist papers of the time. Image: This anti-Slavery medallion, minted in New Jersey in 1838, reads Am I Not a Woman and a Sister and depicts an enslaved women kneeling in chains. That slogan, made popular by Philadelphia abolitionist Elizabeth Margaret Chandler, would come to define the abolitionist movement, particularly in female anti-slavery societies. Abolitionist women sold these medals at anti-slavery fairs, using the proceeds to fund their cause. The image was also used on ceramics, cloth, silk purses and pin cushions. In 1830, Elizabeth Margaret Chandler moved with her brother Thomas Chandler to the territory of Michigan. Her brother purchased land near Tecumseh in Lenawee County, Michigan, about sixty miles southwest of Detroit, an eighty-acre homestead they called Hazelbank. While her brother was "becoming a backwoodsman," Elizabeth, calling herself and her bother "strangers in a strange land," wrote letters to relatives in Philadelphia. She related with nervous anticipation the increased numbers of white settlers arriving by way of the recently completed Erie Canal and plans for a road between the towns of Adrian and Tecumseh. From her perch in their "humble dwelling... composed of longs" that was "said to be the best log house in this part of the country," Chandler described the weather, howling wolves and wild strawberries of her adopted country that was originally Potawatomie land. Chandler participated in national discussions and debates through her articles and poems, and continued to edit Benjamin Lundy's Abolitionist Journal. Lundy wrote: "From this, her quiet and secluded retreat, emanated some of the choicest productions of her pen." 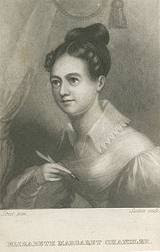 Elizabeth Chandler and her friend and neighbor Laura Haviland organized meetings which eventually grew into the Logan Female Anti-Slavery Society, Michigan's first antislavery association and one of the few in her day which called for the total integration of blacks into American society. This organization also established a main link in the Underground Railroad to Canada. Terrible in crime and magnitude as the slavery of our country is, I do not despair - apathy must - will awaken, and opposition die - the cause of justice must triumph, or our country must be ruined. I should like to have sent you thy patchwork by this opportunity, but have not yet got it finished, as sewing cotton run[s] low with us, and I felt unwilling unless compelled by actual necessity to purchase any of the slave manufacture. The lack of sewing cotton refers to free produce cotton. In several letters to relatives in Philadelphia, Elizabeth requested that they buy and send to her fabric and cotton thread purchased from Lydia White, a dry goods merchant who ran a store that sold only free produce goods. Another merchant selling free produce items was Sydney Ann Lewis; both women were members of the Philadelphia Female Anti-Slavery Society. Elizabeth Margaret Chandler died from "remittant fever" on November 2, 1834, shortly before her 27th birthday. She was buried near the family farm at Hazelbank. During her lifetime, almost all of Chandler's published writing appeared anonymously, but after her death, Benjamin Lundy published two widely-circulated collections of her work: Essays, Philanthropic and Moral and Poetical Works by Elizabeth Margaret Chandler; with a Memoir of Her Life and Character, both published in 1836. The proceeds from the sale of those books went to the abolitionist movement. No, no, pretty sugar-plums! stay where you are! And I love you right well, yet not one will I eat. Driven on with the whip, till the long day is done. And I'm sure I want nobody beaten for me. Even what you have sent me by slavery made sweet.